First, use biological butter - or in other words butter from grass fed cows (if possible). Also, we are lucky that in Europe the laws regarding honey are that it does not need to be pasteurized - so it's very easy to find raw honey here. I didn't know that at first, but with some searching I found this to be true. And recently I've even found very, very raw honey from Turkey that still has a bit of honey comb in it - it's kind of waxy but the taste is sublime. So, use the best honey and butter you can find. Some people say that dark honeys are better for you - that they are healthier, but actually I prefer the lighter and creamier honeys. So, I take about 1 cup or about 200 grams of soft butter (at room temperature) and I put it in my food processor with the attachment used for whipping. And I just whip it for a little bit. Then I add in the honey, I warm it a bit so it's pourable and I just pour in about 1/4 cup. Taste and adjust the sweetness to mood. Then I add cinnamon to taste - usually between 1/2 to 1 -1/2 teaspoons. Plus a pinch to 1/4 teaspoon Chai spice. Then I add about 1/2 to 1 teaspoon vanilla extract and about 1/4 - 1/2 teaspoon maple extract. And I continue to whip throughout the process. I do use a spatula to scrape the sides if necessary and continue to whip till it's like almost melty. And then, I pour it, spoon it, scrape it into my jars or whatever container I will keep it in. The Chai spice mix from Sweet as Sugar Cookies blog (see link above) is pretty good - but it's strong in flavor if you use something like ground cloves in place of the allspice - so beware! 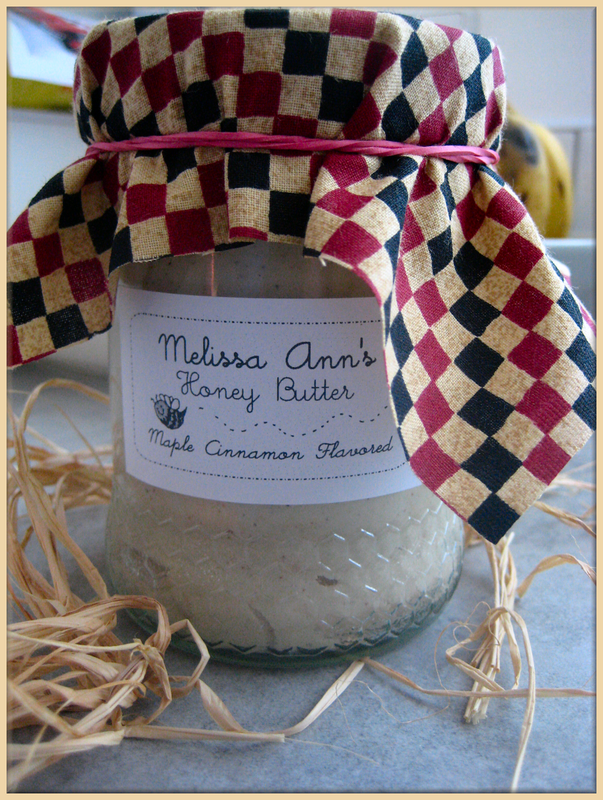 Okay, if it's a gift - I use a nice glass jar - preferably one that had honey in it - because I save the nice jars with the honeycomb design on them just for such an occasion. And then I stick a label on it and some nice fabric. Other wise, I just put it in a Tupperware type container. I refrigerate it overnight, but I usually leave it on the counter through out the day. It takes only a small amount of time to soften it - like 5 to 10 seconds in the microwave - any more time than that and it will melt fast. My Ella requests it frequently - actually she requests "cinnamon toast" and this is what I use to butter her toast with. She loves it.